Australian audio company Nura has launched what it says are the world's first adaptive earphones, which alter their output to suit the user's hearing. Announced last week at the Consumer Electronics Show (CES) in Las Vegas, the NuraLoop earphones are a lightweight, compact version of the company's Nuraphone over-ear headphones. Both the headphones and the earbuds pioneer a concept known as adaptive audio, where the levels are automatically adjusted to suit the user's "unique" hearing profile. This means that a person who lacks sensitivity to low tones will receive increased bass, while a person whose sensitivity dips in the mid-tones will have those levels increased accordingly. The earphones test a wearer's hearing when they first put them on by measuring otoacoustic emissions — sounds generated by the inner ear in response to stimuli. The analysis takes about a minute, and as Nura puts it, there's "No need to take a 'Can you hear this?' test". "A person's hearing is as unique as their face, fingerprint or voice," said Nura co-founder and CEO Dragan Petrović. "That's why trying to design a perfect sound-system without taking into account the listener's hearing system would be like trying to make glasses without asking 'Who is going to be wearing them?'" "There is no such thing as a perfect sound-system — only one that is perfectly matched to you," Petrović continued. The company's Nuraphones first launched on Kickstarter in 2016, becoming Australia's largest ever Kickstarter campaign with a total US$1.8 million (£1.4 million) raised. Among the earbuds' other features are noise cancellation and, conversely, a social mode, which adjusts levels to allow more of the surrounding environment and conversations through. 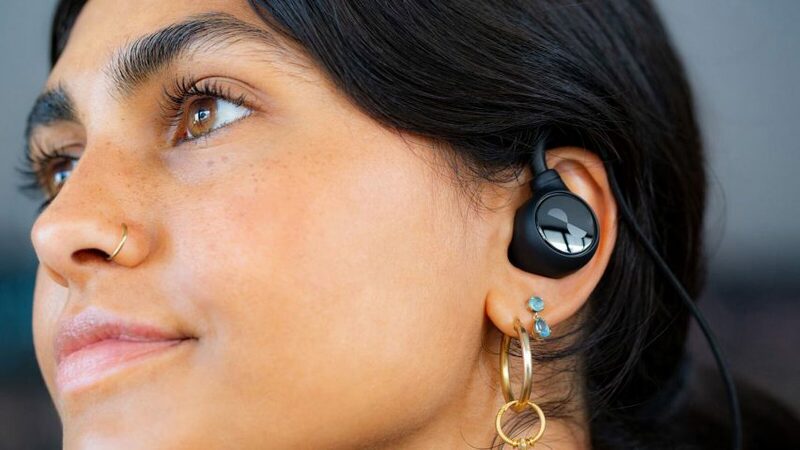 The Bluetooth earbuds are connected by a black loop that rests behind the wearer's neck. For controls, NuraLoop has a "TouchDial", which responds to a tap, double tap or dial to trigger different functions. Melbourne-based Nura will make the earbuds available later in 2019. Among the other products launched at last week's CES, the biggest tech show of the year, were a roll-up TV from LG and a commercial quantum computer by IBM and Map. The last two years have seen a number of advances in earphone technology, with Google launching Pixel Buds that double as language translators and Bose producing a pair that are actually sunglasses, and aptly called Frames.